Matthew Apgar - mapgar@shawmedia.com Justin Peters has help attaching his eyelashes from Savina Caniglia, right, as Peters gets into his drag queen persona as "Dee Licious" before a sold out crowd for the 4th annual Drag Show on Friday, April 17, 2015 at McHenry County College in Crystal Lake. The show, put on by Pride Club, uses money earned from the show to help fund a scholarship of $500 per semester. 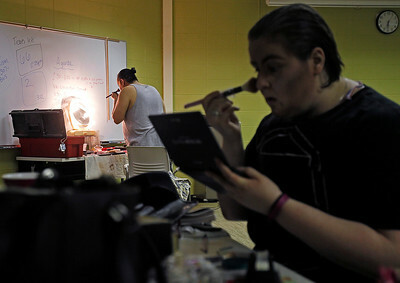 Matthew Apgar - mapgar@shawmedia.com Drag performers Narciso Torrentt, back, and Megan Riordon put on their makeup backstage before a sold out crowd during the 4th annual Drag Show on Friday, April 17, 2015 at McHenry County College in Crystal Lake. The show, put on by Pride Club, uses money earned from the show to help fund a scholarship of $500 per semester. Matthew Apgar - mapgar@shawmedia.com Lisa Walsh sprays her hair backstage as she gets into character as "Lisa LaVintage" before a sold out crowd for the 4th annual Drag Show on Friday, April 17, 2015 at McHenry County College in Crystal Lake. The show, put on by Pride Club, uses money earned from the show to help fund a scholarship of $500 per semester. Matthew Apgar - mapgar@shawmedia.com Narciso Torrentt uses a strong, fast-drying glue to attach a large hoop earring to his "Cee-cee LaRouge" drag queen persona backstage before for a sold out crowd for the 4th annual Drag Show on Friday, April 17, 2015 at McHenry County College in Crystal Lake. The show, put on by Pride Club, uses money earned from the show to help fund a scholarship of $500 per semester. Matthew Apgar - mapgar@shawmedia.com Drag performers (from front:) Justin Peters as "Dee Licious", Narciso Torrentt as "Cee-Cee LaRouge", Megan Riordon as "Eed Licious", Sam Lasko as "Scotty Green", and Jake Kvidria as "Nikki Lixxx" entertain for a sold out crowd during the 4th annual Drag Show on Friday, April 17, 2015 at McHenry County College in Crystal Lake. The show, put on by Pride Club, uses money earned from the show to help fund a scholarship of $500 per semester. Matthew Apgar - mapgar@shawmedia.com Ben Miller reacts after being pulled from the audience for an impromptu dance from Narciso Torrentt as drag queen "Cee-Cee LaRouge" during the sold out 4th annual Drag Show on Friday, April 17, 2015 at McHenry County College in Crystal Lake. The show, put on by Pride Club, uses money earned from the show to help fund a scholarship of $500 per semester. Matthew Apgar - mapgar@shawmedia.com Performers entertain for a sold out crowd during the 4th annual Drag Show on Friday, April 17, 2015 at McHenry County College in Crystal Lake. The show, put on by Pride Club, uses money earned from the show to help fund a scholarship of $500 per semester. 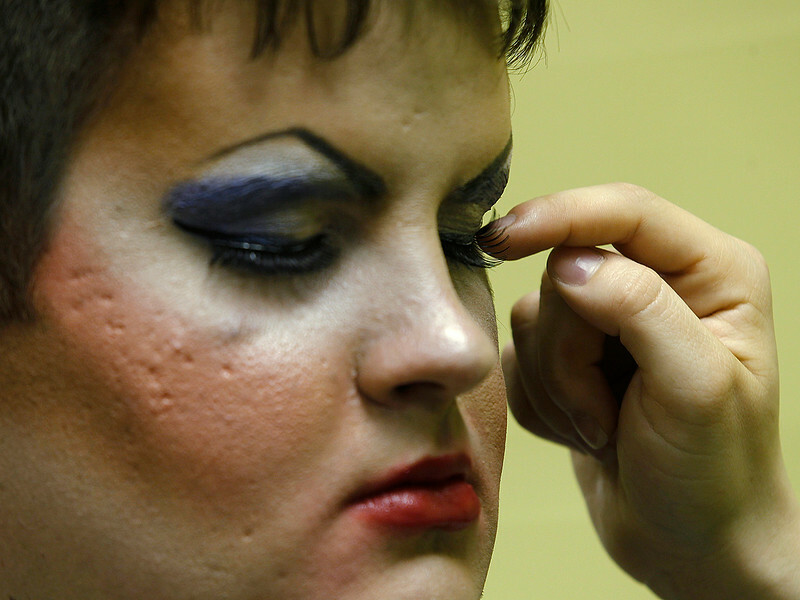 Justin Peters has help attaching his eyelashes from Savina Caniglia, right, as Peters gets into his drag queen persona as "Dee Licious" before a sold out crowd for the 4th annual Drag Show on Friday, April 17, 2015 at McHenry County College in Crystal Lake. The show, put on by Pride Club, uses money earned from the show to help fund a scholarship of $500 per semester.